March to your own beat !! Hi Everyone! One of my sweet friends is having a birthday tomorrow. He calls himself my "old hippie friend"
Unfortunately I could not find Tye-die paper so I improvised. This is from Freshly Picked and Cars. 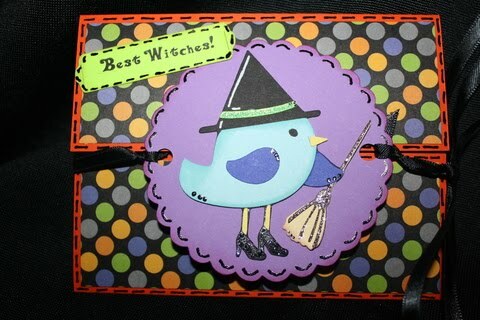 This is a Halloween card created with 3 Birds on Parade, Stamping and Tags, Bags Boxes and More. Enjoy!!!! 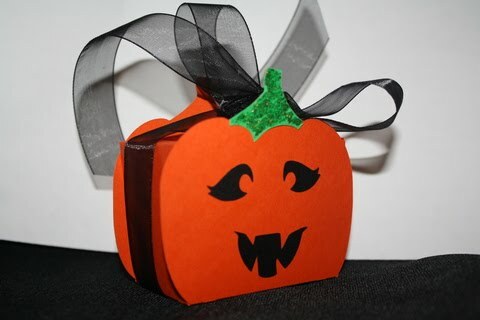 Just a simple 3D halloween box to fill with treats !!! This was made with the Happy Hauntings cartridge and the Pumpkin Carving cartridge for the face! Enjoy! School Blog Hop Winners !!!!! I cant believe it chose 2 people that have been followers of mine for awhile, thanks ladies for your loving my blog and commenting !!! Please email me your address to michelle@scrappinwithmybug.com the FIRST one to email me gets the choice of what prize they want !!!!! I love getting packages !!!! So I got two packages, I mean who doesnt LOVE getting packages???? 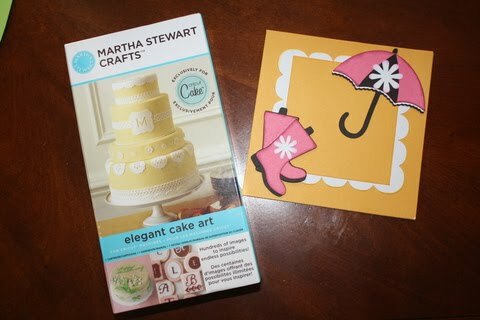 The first package I received was from my circle sister Alma...from My Pink Life....She sent me a really cute card AND a Martha Stewart cartridge !!! whooo hoo thanks girl you rock !!!! 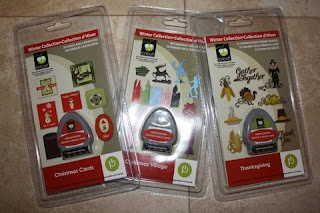 My 2nd package was my winter mini's I ordered from Terri at Stamps Alive she is awesome as well!! Dont forget to check back tomorrow for the WINNERS of the School Blog hop from the FCCB Cricut Crawl! !! Winners of Halloween Blog Hop !!! Thanks for such a great project!! Great video!! Check back on Wednesday for the winners of the School Blog Hop !!! This weeks challenge is make something having to do with gardening. What is the best garden of all but Nature's garden! 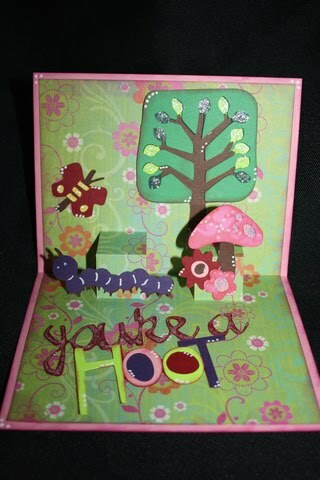 I created a pop up card (with an owl on the front) I used Hoot n Holler, Walk in my Garden, and Live Simply. 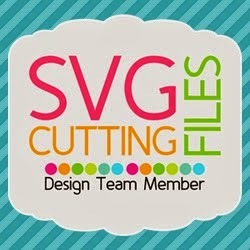 If you would like to join us in this challenge please visit the Fantabulous Cricut Challenge Blog! Enjoy!!!! Hi Everyone !!! Are you ready for Halloween? If you just started the hop and want to start at the beginning or get lost along the way please click HERE. You should of just came from the Scrappy Scavenger if you did your on the right track !!! Today I have 2 giveaways which I will reveal at the end of the video, For an chance to win, please follow my blog and leave a comment on how you liked it......or not LOL... I will draw the winner Sunday night (tomorrow) so please check back! IF YOU LIVE IN NORTHERN CALIFORNIA, WE WILL BE MAKING THIS AND 2 OTHER PROJECTS IN CRICUT CLASS TOMORROW, EMAIL ME FOR DETAILS !!! The next stop on the hop is Kute Kassidy's Inking it up Crazy !!!!! Thanks so much for stopping by !!! 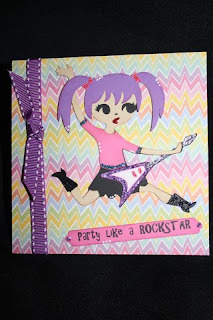 Party like a Rock Star !!! 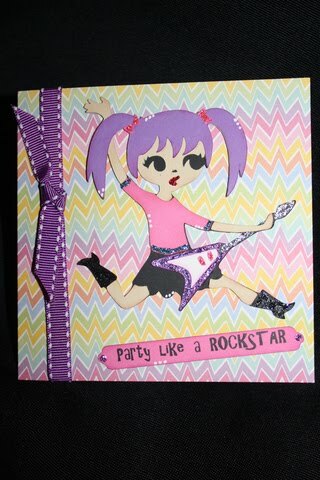 I used of course Rock Princess and Tags, Bags, Boxes & More also used Pink by design stamps and stickles~~ Enjoy !! This is my first guest designer my 5 yr old daughter Lily! This card was made for my husband for his birthday! She did everything herself even running the Cricut, she absolutely LOVES it! This was made with the Simply Charmed cartridge. Enjoy !!! I created an super cute Art folder with Makin the grade and Locker Talk! Watch the video below for details of my project and the prizes! 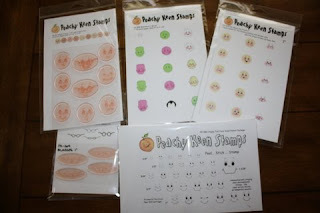 After your done the next stop on the hop is the adorable Cooking with Cricut !!! If you get lost along the way you can always start back at the Fantabulous Cricut Challenge Blog! I used Gypsy Wanderings, Simply Charmed, Create A Critter, and Doodlecharms. Also ribbon, stickles, PK stamps, gel pen and brads. Enjoy! Im a winner! whoo hoo! Can I get a whoo Hoo?? 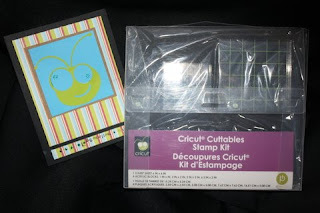 I was picked to receive this package from Crazy about Cricut on facebook! It was pretty simple I liked her page (of course I do LOL) and made a comment on a post a wha La! Thanks so much Jenny I DONT have this! Are you shocked? LOL Very excited !!! yippy! She even made me this super cute card !!!!! Ive had several people ask me how to use the Cricut Markers. This is a quick video showing you how to use the Cricut Markers with your machine and Gypsy !!! Enjoy! 3 Birds in the house !!!! I recently got 3 birds so I of course had to make something! 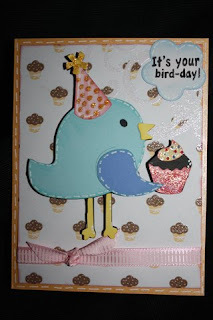 I have a friend with a birthday coming up so I wanted to make this cute bird holding a cupcake! The bird is from 3 Birds on Parade and the cloud is actually a white flower from Mini Monograms that I inked blue around the edges. I used stickles (of course), pop dots and a MPS stamp....inside is a birthday stamp and cupcake stamp my circle sister recently sent to me, also the cute ribbon with the white picket fence on it (got it on clearance after Easter....can I get a whoo hoo)... Enjoy! 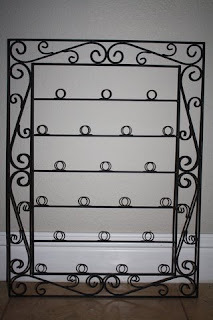 So I purchased these black metal card holders to put in my craft room. Of course black isn't the color of the rest of the hardware so I had my husband spray paint them with Krylon hammered brown spray paint. It is awesome it gives the metal a hammered look! So this is a pic of before and after, and my problem now is thinking up some kind of saying to put in the room, maybe above the card racks? Any saying suggestions would be great! I will find something to give to the person that comes up with the saying I choose! In case of duplicate suggestions , the prize will go to the first person that suggest the saying first. 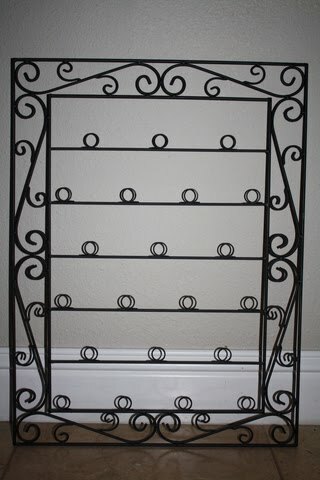 ********These are $19.50 and you can order by clicking HERE they ship directly to YOUR home!! Happy Labor Day Everyone! 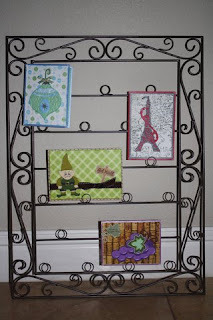 This weeks challenge is to create something related to labor day! 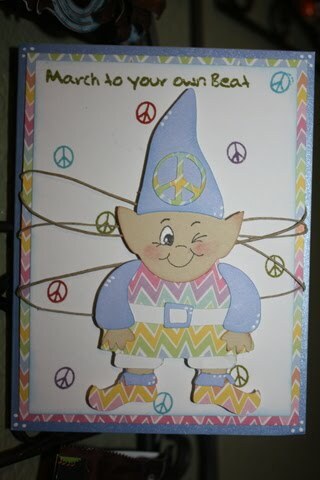 This card is made and dedicated to all the men and women in Law Enforcement! So many years My husband and I worked Thanksgiving, Christmas, Birthdays, Family Reunions, and back to back 18 hour shifts. Each day they sacrifice time away from their families protecting us, many complete strangers from harm. Some even make the ultimate sacrifice and that is what this card is for. 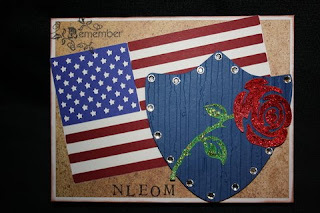 The NLEOM stands for the National Law Enforcement Officer Memorial. Their symbol is the badge with a rose through it. I created this card with Independence Day for the Flag, Everyday Paper Dolls for the badge, and Indie Art for the rose. 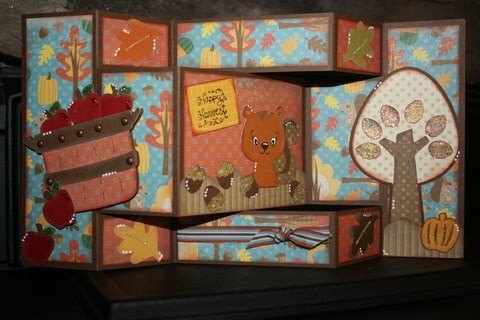 Also used was the Distressing stripes Cuttlebug embossing folder. I also used rhinestones and red and green stickles for the rose. SO the next time you see a Police Officer, Fireman, or Soldier take a minute to thank them for their service. They are putting their life in harms way to save and protect what is most dear to us, our families. If you would like to participate in this weeks challenge please join us over at the Fantabulous Cricut Challenge Blog !!! 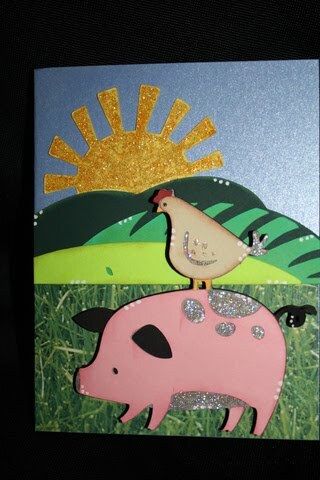 This is a card for my brothers upcoming birthday, yep you guessed it he's got farm animals LOL !! I used the new Country Life cartridge also used stickles on the pig and the sun! The chicken and pig are pop doted as well. Enjoy !!! Want a free cartridge ???? 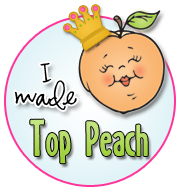 As you know I am part of the Cricut Circle. Im sending out invitations for YOU to join! If you join I will receive 100 rewards points per person that signs up before September 13th ! Thanks and I HOPE to see you in the circle! 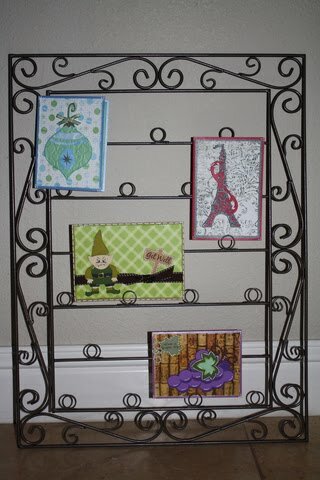 PK stamps & Tim Holtz folders !!! 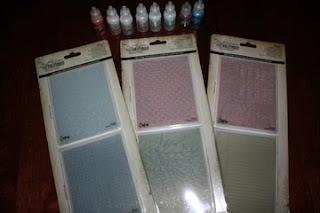 Also OMC had buy 2 get 1 free Tim Holtz embossing sets, so of course I had to pick up some of those LOL !!! and some stickles! Sorry I keep posting my bargains instead of my creations but Im sick with a head cold so not much "crafting" going on. thanks !